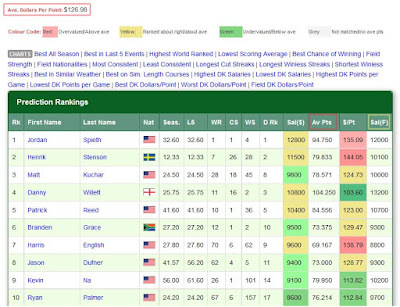 I am pleased to announce the addition of useful new Tournament Streak and Rest Steak stats to Golf Predictor. The former shows how many consecutive tournaments each golfer in the field has played in the current season before the current event. Thus, it can be used as an indication of how fresh or tired each entrant might be on tournament week. Rest Streak is a related stat and shows how many weeks each golfer has had off since playing their last event in the current season. Obviously, one of these numbers always has to be zero for each golfer, after their first event of the season. I have created a new Rankings (Streaks) page in the Predictions menu that shows these new stats in columns, along with the existing cut streak and winless streak stats and charts. A snapshot of this new page is shown in the first screenshot above for the 2016 WGC - Dell Match Play. I have replaced the cut streak and winless streak columns on the main Rankings page with the Similar Weather and Similar Tournaments columns. The streak columns and charts have also been removed from the Rankings (Odds) page. I have created a new Streaks panel on the Prediction Data page for each golfer. The winless and cut streaks have been moved from the General panel to this new panel and the two new streaks have been added to it. This new panel can be seen in the second screenshot above for Jason Day ahead of the 2016 WGC - Dell Match Play. 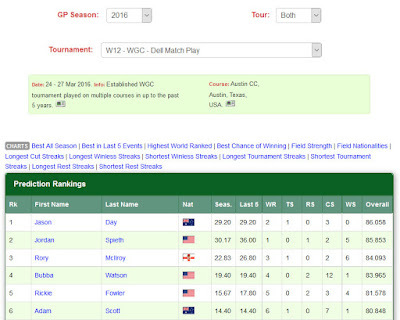 The last tournament played in the current GP Season by the golfer is now also displayed in the new Streaks panel. This is shown for all golfers even for tournaments before these new streaks are available for and can be seen at the bottom of the panel in the second screenshot above. To keep things simple, GP Weeks are used to count these streaks during the season. These will usually be equal to calendar weeks, except for weeks where there are no individual tournaments at all on either major tour, e.g. Ryder Cup week. Withdrawals are not counted unless the golfer finished at least one stroke play round before pulling out. Only individual tournaments on the two major tours that are covered by Golf Predictor* will contribute to these streaks. Other events that the golfer may play, e.g on another tour, such as the Web.com Tour or as a team (e.g. Ryder Cup), will not be counted. Non-stroke play (i.e. match play and Stableford) tournaments that the golfers withdrew from having played one round are not counted for these new streaks. This is because rounds are only tracked for stroke play events on Golf Predictor. However, this is a rare scenario, so it shouldn't be an issue. Golfers playing their first events of the season will be assigned a value of "n/a" for these streaks. The tournament streak information is now factored in to the GP algorithm, with longer streaks being penalised due to possible tiredness. Rest streak was already factored into the algorithm in a similar fashion to account for possible rustiness. These new streaks (and associated charts) are not available prior to week 12, 2016 (the week of the WGC - Dell Match Play and Puerto Rico Open at Coco Beach). You may have to refresh an updated page to see the changes. These four new charts will not be available until week four of any future GP season. Since these new streaks are based on season results, it doesn't make much sense to start charting until these stats start to matter! I trust you will find these new streak stats useful for your tournament analysis. Any feedback (via comments on this article or email) would be most welcome. 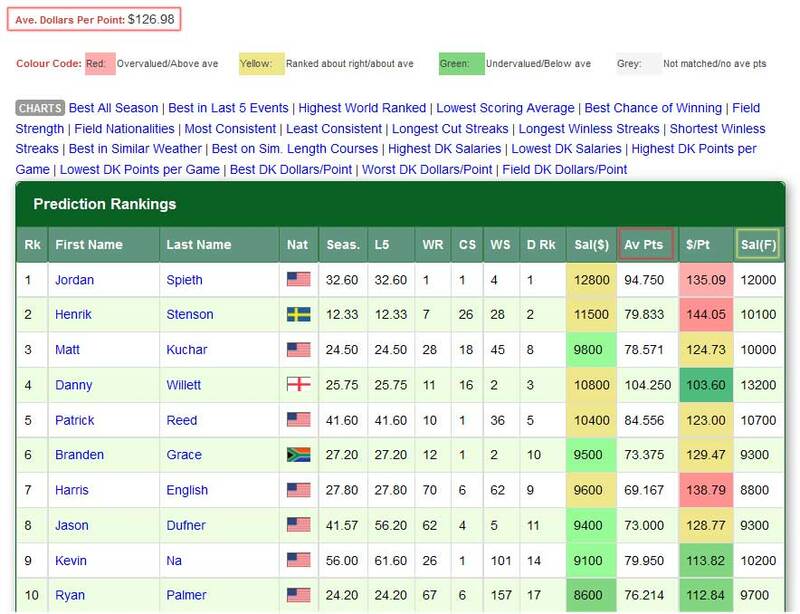 Like the other prediction data, non-subscribers can only see these new streak stats for golfers ranked 11-25 in the prediction rankings and will not be able to see the new charts. Therefore, sign up today and reap the full benefits of Golf Predictor, the premium professional golf statistics site. *GP covers all such tournaments except the small fielded junket near the end of the year that is Tiger's tournament! The predictions and statistics for this week, the Shell Houston Open (US PGA Tour), are now available on Golf Predictor. It's the final tune-up for the Masters and there's a strong field in Houston, where the course is set up like Augusta as usual. Nine of the top twenty in the world are teeing it up and it looks like they will have to contend with difficult conditions as the weather in Texas is promised somewhat damp and windy this week. Jason Day (ranked 1st by Golf Predictor) won the WGC - Dell Match Play Championship on the European/US PGA Tour. The 28 year old Australian secured his second tournament in a row and second WGC-Match Play title in three years with a 5&4 win over Louis Oosthuizen in the final. Day overcame an injury scare with his back on the opening day and played some great (if slow!) golf to take the victory in Austin, Texas. Day had reclaimed the number one spot in the world rankings by making the semifinals, but went on to cement his position as top dog by taking the title. Rafa Cabrera Bello defeated defending champion Rory McIlroy in the third place play-off. Last last year, a surprising number of the bigger names exited after the round robin stage. Tony Finau (ranked 11th by Golf Predictor) won the Puerto Rico Open at Coco Beach on the US PGA Tour. The 26 year old American finally won his first tour title in windy Puerto Rico in a play-off with Steve Marino. Both players were vying for their first tour win, but it was Finau who completed his incredible journey to the top of the game with a birdie on the third extra hole. Our top ranked player, George Coetzee, finished in tied 35th and in this usually difficult to predict event, we had ten of the top twenty one plus ties (10/25). I am pleased to announce the addition of another column to the DFS page on Golf Predictor. This new "Fair Salary" column is related to the existing DFS information on the site and should help to emphasise the good/bad value golfers. This new column is shown above for the 2016 Valspar Championship (header highlighted in yellow) with the abbreviated header text of "Sal(F)". 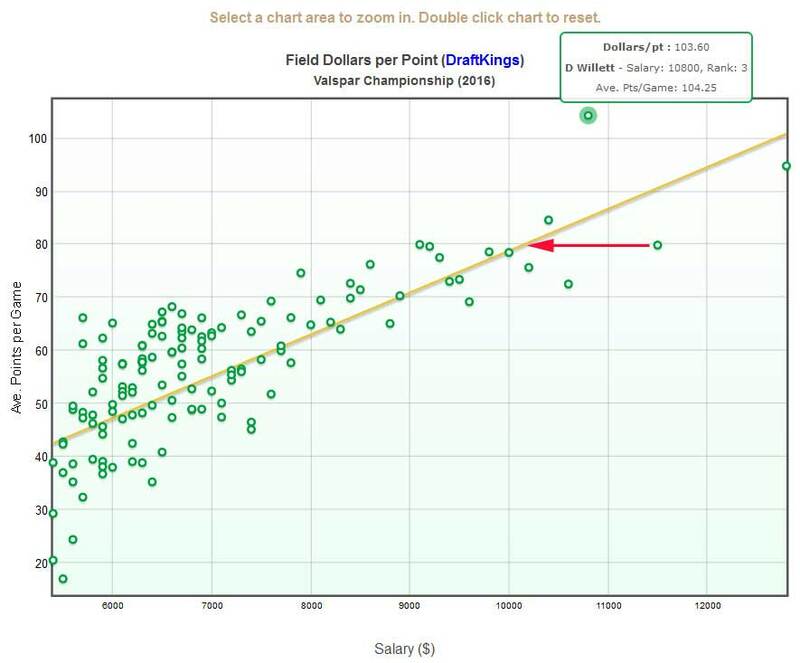 This new column shows what the DraftKings salary should be for each golfer, based on the average dollars per point for the field. Overvalued golfers whose dollars/point column is highlighted in red will have fair values less than their actual salaries. Those whose dollars/point column is green (undervalued) will have fair values greater than their actual salaries. Finally, golfers whose dollars/point column is yellow (salary about right) will have fair values very similar to their actual salaries. Essentially, this "fair" salary is the numbers highlighted in red in the image above (the average dollars per point for the field and the average points per game for the golfer) multiplied together and rounded to the nearest 100 (like DraftKings!). If all golfers in the field had these "fair" values, the DFS scatter chart on Golf Predictor (see image below) would have all the golfer points on the average line*. With respect to the DFS scatter chart, this new column on the DFS page shows the value where the golfer's average points per game value hits the average line. This will always be a horizontal movement from the golfer's data point and is shown above with the red arrow for Henrik Stenson ahead of the 2016 Valspar Championship. I trust you will find this new column useful for identifying value DFS picks. Just another way to make Golf Predictor a little better! *The rounding to the nearest 100 means that this would not be exactly true! not taken into account.Golf Predictor blog feed. Adam Scott (ranked 8th by Golf Predictor) won the WGC - Cadillac Championship on the European/US PGA Tour. The 35 year old Australian also won his second title in as many weeks with another impressive performance. Despite two double bogeys early on Sunday that saw him fall six behind then runaway leader Rory McIlroy, Scott showed great character to bounce back with a flurry of birdies to take the lead on the back nine. Even though he shanked from a bunker on the 16th and miraculously missed the water on the last, Scott managed to hold off Bubba Watson for a one shot victory. McIlroy was our top ranked player, and the usually great frontrunner will be disappointed with his tied third finish after leading the field by four shots early on Sunday. Overall, we had twelve of the top seventeen plus ties (12/22). There was no other event on either major tour this week. The predictions/statistics for this week, the WGC - Cadillac Championship (European/US PGA Tour), are now available on Golf Predictor. Just the one event this week and all eyes will be on Doral this week to see if presidential hopeful and course owner The Donald will turn up as usual to watch the action. If he does, he'll have the usual strong field to rant at, as forty seven of the top fifty in the world rankings will be teeing it up at his Trump National Doral!